Long time between postings, so this is overdue.. I got an "I Love Your Blog" award from a couple of people – Jace from Jace Scribbles and Angiegirl of Angieville. This is pretty awesome that they like my blog – and I read both of these blogs faithfully too, so right back at you! 1) Tez Says – Well Tez has a livejournal too, but this is her book blog. She's a sweetheart, and she's got a good sense of humor – every so often she writes something that makes me grin like a fool. Her book blog is slanted to urban fantasy and what I like to read so it's interesting to see her opinions. P.S. She has a cat who models books for her. 2) Lights, Camera, History – This isn't a book blog, but I love it! This was actually created by a couple of girls whose book blogs I read, and it focuses on period dramas. Sigh, I get so happy when I get introduced to a movie or miniseries want to watch. Then I force my husband to watch it with me. 3) Books and Other Thoughts – This is another book blog I read often, and she's added to my list of books I want to read one day. I think she's gotten the I love your blog award already but I'm just going to add to it! 4) Cosy World - This is one of the girls behind Lights, Camera, History. Her blog is a mix of things – books, movies, food. Always interesting. 5) Urban Fantasy – Deety's blog I think I ran into one day while googling .. something. I can't remember now. It was a newish blog then, and I immediately liked it. Now I've been reading it for a while and I'm always glad when she updates. Her reviews are always well written, and I'm always interested in what she thought of certain books because she's one of the people whose reviews I trust more than others. 6) J's Book blog – Maybe it's cheating to give this to someone you know, but eh. 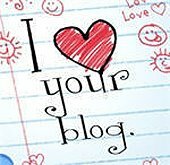 "J" and I started our book blogs at about the same time, and although her posts are sporadic, I still am gleeful when she posts something. She's a big reader of romantic suspense right now. Think of this as nagging to post more. 7) LesleyW's Book Nook – Another book blog with many urban fantasy books. More paranormals here too. There may be a trend in the blogs I love. She's also already gotten a I love your blog award already, but hey, here's another.